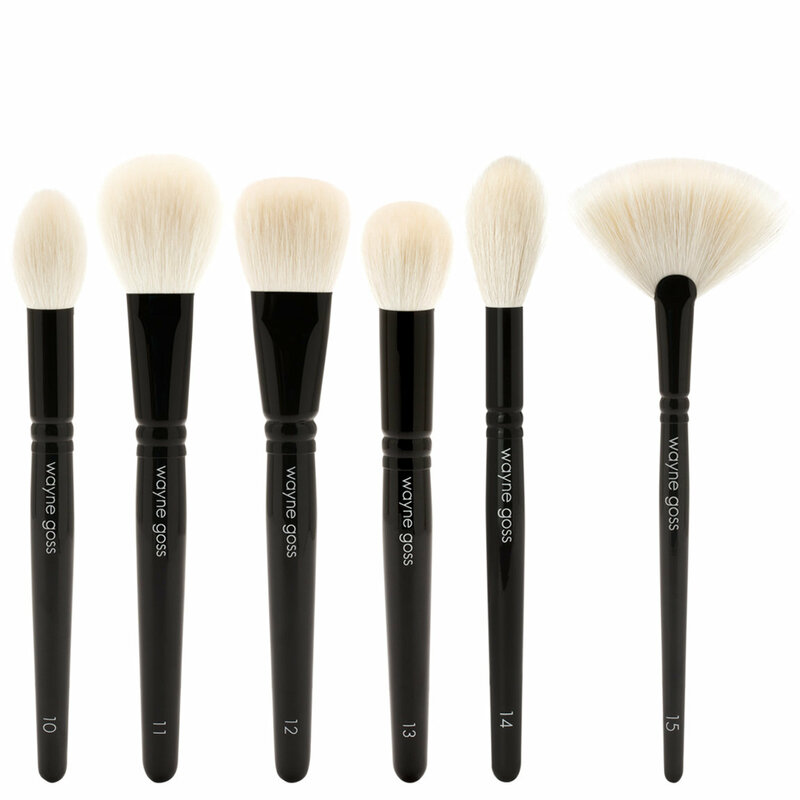 Enhance your complexion and create a flawless canvas for makeup with this set of six elegantly handcrafted brushes from makeup artist Wayne Goss. As versatile as it is easy to use, The Face Set delivers expert-level results when applying foundation, contouring, highlighting, and everything in between. Wash your brushes occasionally with a gentle brush soap and let them dry hanging upside down. As with all brushes made with natural hair, some shedding may occur during the first few uses. Just received this set in the post. I have a few of the old face set (12, 13, 15) which I have placed next to this new set for comparison. This new set is truly softer compared to the older oones (the old ones are already SUPER soft). I love these brushes, they are super high quality, and to be honest I prefer them to my suqqu/hakuhodo brushes. 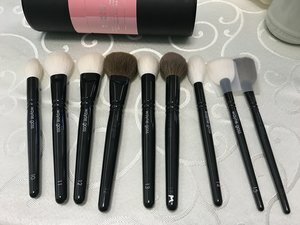 I would definitely recommend this to people looking to invest in a set, hand made by Japanese artisans, excellent quality, and actually cheaper compared to brands like hakuhodo/suqqu. 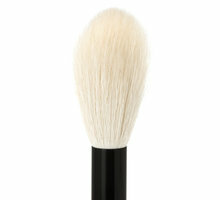 These brushes are so smooth and so well made that even the most inexperienced makeup artist can get a flawless result. I have never found brushes that transition seamlessly from liquids to powders like these do. These brushes are well worth the hefty price tag. 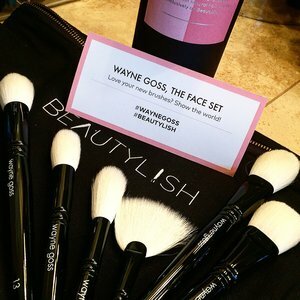 The brushes are beautiful, soft, glossy, and did I mention soft? SO soft! Everything went on as beautifully as possible. Then when I was done, I decided I should blend everything some more, because did I mention how soft these brushes are? All that said, the handles look a little cheap. Even more perfect than the original. I have the original face set (excluding #10), and now own the new face set. When the brushes are all freshly washed and dried the difference in softness isn't significant. I prefer the new set only because of brush #10. I had zero interest in the original #10 because I rarely wear liquid foundation, and when I do, I prefer to use a flat synthetic and a beautyblender. I do love brush #2 for setting my under eyes, and had been considering getting duplicates anyway. The new brush #10 is equivalent to the #2, so it's perfectly interchangeable. Now I essentially have duplicates for all my favorite face brushes without having identical ones I can't tell apart. I will add that I have skin that is easily irritated, and have many broken capillaries on my cheeks that can become inflamed with rough brushes. 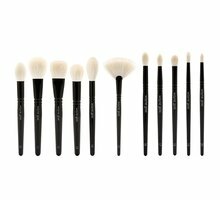 I haven't had that problem since I started using the first Wayne Goss face set, and I'm equally thrilled with the new set. Since I got Waynes first Face Set, I never ever reached for any of my other (truly expensive! :-( ) brushes again and -I didn't considered this for possible- but the bristles of the new Face Set are even softer (they must have used unicorn hair) and the shapes are well-thought-out. Normally my make-up skills are amateur-like but with those brushes my make-up looks just so flawless, its incredible. I can even make some products with awful textures work for me now. I'm broke but happy - these brushes are so damn worth every penny! When these were delivered, I immediately ripped open the box and got into them like something feral. My very first thought about the face set was that the brushes were smaller than I thought they would be, especially the no. 13 brush. I had also thought it would have more hairs (and be denser) than it is, based on the images and Wayne's youtube video on the new face set. During my first foundation application, I found that the brush really had a lot of give, and the bristles soaked up a lot of product, which would be less of an issue if the brush was denser. Despite the whole issue with having to use more product, the results were very natural looking and the finish was nice and there was no streaking or brush marks. The no. 10 brush is identical in size and shape to my no. 2 brush from the anniversary set. This was a good thing in my opinion, because I love the no. 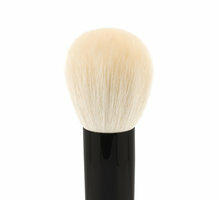 2 brush, but I don't want to damage the blue squirrel hairs on it by using it to blend and set the under eye. That makes the no. 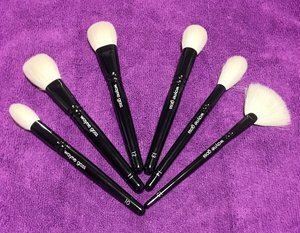 10 brush really great, and it's also great just to have another brush that shape since despite having over 100 designer brushes besides my Wayne Goss brushes, I did not previously have any that were that shape and size. I think it's a fabulous brush to use with the Charlotte Tilbury Filmstar Bronze & Glow compact, either the no. 2 or the no. 10, and MUCH higher quality than Charlotte's brush meant for that (seriously, don't buy that brush, it's really bad and costs $11 more than the no. 10 on its own.) The no. 11 brush is a really nice small powder brush, I like the shape of it being a paddle instead of a round brush, although that tends to limit you to a back and forth motion instead of circular motions, because it isn't that comfortable to do it that way- and I know it is meant to be used for the buffing technique, but to do any actual buffing, you'd probably want to only use the tips of the bristles, because the more pressure you apply, the more it kind of locks you out of the circular motion. You could obviously do it anyway, but it would feel weird doing it and you would likely accelerate wear and tear on the brush. It is a very nice, very soft brush (as they all are) and a lot more portable than any of my other powder brushes due to the small size. The no. 12 brush is a densely packed, paddle shaped brush with shorter, tighter bristles than the no. 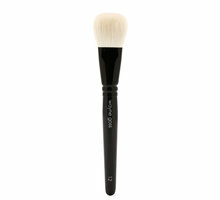 11 brush, and is great for blending edges or doing contour or bronzer, or even pressing blush into the skin. You can get a lot of payoff with it, so depending on the product you might need to be careful not to overload it with very pigmented products. 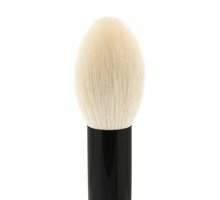 Depending on what I'm trying to do, I can get all the impact I need using this brush and a product with a sheer-medium pigmentation since I have fair skin. The no. 14 brush was honestly a happy surprise for me once it arrived. I had a cheap (and horrible) tarte brush that is the same shape for about two minutes because it came in a large holiday gift set with makeup items. I was very afraid this brush would be like that brush, luckily it isn't. Despite the shape of the no. 14, it has a good number of bristles and isn't nearly as flimsy as I was fearing. It is an absolutely fabulous highlighter brush, or if you're fair using a pigmented contour powder, you could definitely use this. I personally would not use this for blush due to the size and shape, I'd use the no. 11 or 12, or the limited edition "airbrush" for that. However, you can obviously do whatever you want. As for the last brush, the no. 15 fan brush- I am not a fan of fan brushes, and almost didn't buy the full set because of the no. 14 and the no. 15 (not wanting them) but as fan brushes go, this is a very, very nice one. I was amazed looking at the brush that they aren't cut on the ends, because the shape is so absolutely perfect it looks like it would definitely have to be cut to get such a perfect shape, however the tip of each and every hair is intact (it tapers off the way hairs do) so this is just incredibly well made. This is really great for applying very pigmented highlight in a subtle way, or even applying very fine pearl or glitter pigments as highlight. I definitely would not apply any kind of glitters with the other brushes in the set, because they are much too dense and I wouldn't end up achieving the look I was going for that way. 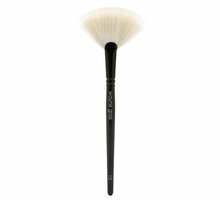 This would also be a great brush for just glazing the skin lightly with a dewy (pearl) finishing powder. So I still personally have a "thing" against the fussy, easily mangled fan brush, but this is a really, really beautiful one, and it definitely has a few great utilities. These are my new favorite face brushes. I've tried quite a few brands, everything from drugstore (and I still enjoy my Real Techniques, tbh) to other high-end, Japanese brands (Hakuhodo, Chikuhodo) and this set is hands down the best I've used. 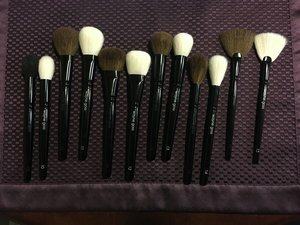 I recommend you go to YouTube and watch Stephanie Nicole's video on how to clean and care for these brushes, however. I'd hate for anyone to spend this much money and destroy them by washing them incorrectly. Imagine morphing a tongue-shaped foundation brush with a conventional blush brush, a pointed highlighter brush with a chikuhodo z series round contour brush, a smudging brush with a highlighter brush. Name some othe combinations, and the products would be WG new face set. The best way I can describe these new brushes would be "in-between." One can get multiple uses of each brush in this set, and they perform almost equally well for all the tasks you try with. The texture of these brushes are also "in-between." They have the softness of squirrel hair and also the ease to pick up liquid and powder. The fine craftsmanship and the high quality, shining hair remind me of Koyudo brushes, yet the price point is just too sweet for Koyudo brushes. Overall the brush set would be a good introduction set for novices to the fine makeup brush world as well as a nice addition for collectors.